Qualcomm lifted the lid on its next-generation premium smartphone processor platform this week in Maui, Hawaii — the Snapdragon 855. The chip will undoubtedly end up powering a number of 2019’s highest profile smartphone releases, improving processing power, multimedia, and streaming data speeds, plus much more. The company already confirmed this is its first 7nm chip, matching Huawei’s Kirin 980, but there are a host of other improvements. Top of the bill is a major uplift to Qualcomm’s AI and machine learning processing capabilities, an area other companies have been pushing performance in as well. There’s also a new CPU setup, faster Adreno graphics unit, and much faster connectivity options as the industry ramps up its move towards 5G networks. At its heart, the Qualcomm Snapdragon 855 is a 7nm octa-core processor. The Arm DynamIQ CPU cluster design is a little different this time around, with four small Cortex-A55 cores paired up with three big cores, based on Arm’s Cortex-A76 design, and an even bigger “prime” Cortex-A76 core which targets even higher peak performance. Compared to its predecessor, the Snapdragon 845, the Snapdragon 855 doesn’t see massive CPU clock speed boosts or anything. However, the Kryo 485 CPU cluster transitions over to a semi-customized design of Arm’s latest Cortex-A76 CPU part. Qualcomm boasts a 45 percent CPU performance boost over the last gen, which is a surprisingly big lift for more demanding applications. The Snapdragon 855 also features a more powerful Adreno 640 GPU. According to Qualcomm this offers a 20 percent performance boost over the previous generation. Based on what’s we’ve seen so far from Arm’s Mali G76 rival part, we’re expecting a firm lead for Qualcomm’s latest chip in the gaming department yet again. The graphics chip also offers an HDR pipeline for gaming and support for high-quality physically-based rendering. Additional features include a new image signal processor, which support 4K HDR video content recording with a 30 percent saving for power consumption. Part of this package includes the Cinema Core, an H.265 and VP9 video decoder boasting a 7x gain for energy efficiency. This also includes HDR10+ playback at up to 120fps and 8K playback (certainly overkill for mobile), and support for 360-degree videos. Other familiar features, like aptX support, including hardware support for aptX Adaptive, and Quick Charge support remain on board too. Arm’s DynamIQ cluster technology is enabling some more interesting CPU configurations than the 4+4 big.LITTLE designs of yesteryear. The shared cluster design and introduction of a shared L3 cache allows for more flexibility with each core’s individual L2 cache. This means individual CPU cores can be tailored to specific performance points and sizes while still retaining the benefits of tight unity within the same cluster. This “little, mid, and high” tier approach is becoming increasingly popular as a result. Qualcomm has come to grips with these benefits in the Snapdragon 855’s design, opting for a 1+3+4 design rather than the traditional 4+4 setup. The larger shared L2 cache of the biggest core, combined with a separate higher peak clock speed, will yield higher performance for where its needed. If you’re interested, there’s 512kb L2 cache on the big core, 256kb on each of the three middle cores, and 128kb for each small core. The 1+3+4 core CPU design is tailored to higher single thread performance which can be sustained for longer. Although Android is comfortable with heavy multi-threading, app use cases seldom require more than bursts from a single high-performance thread. Arm has been acutely aware of this for a while, noting that just a single big core (such as a 1+7 DynamIQ design) would offer huge performance boosts to low-end devices. Second and third cores are sometimes required for moments of heavier lifting, but these typically don’t require quite the same level of sustained peak performance. Smaller cores are most often just used for background processing or low energy parallel tasks. By focusing effort on a single very high-performance core, Qualcomm’s chip should also offer longer sustained performance. The only real concern with increasingly divergent CPU designs is task scheduling needs to be handled even more carefully than traditional big.LITTLE designs. With less equivalent cores to choose from, reallocating tasks to different cores could cause stalls and hinder performance. If the scheduler is up to the task, this appears to be a very efficient mobile CPU design. AI remains one of the mobile industry’s persistent buzzwords, but machine learning presents some real benefits to consumer devices. To that end, Qualcomm has revamped its Hexagon technology inside the 855 with some additional processing power. 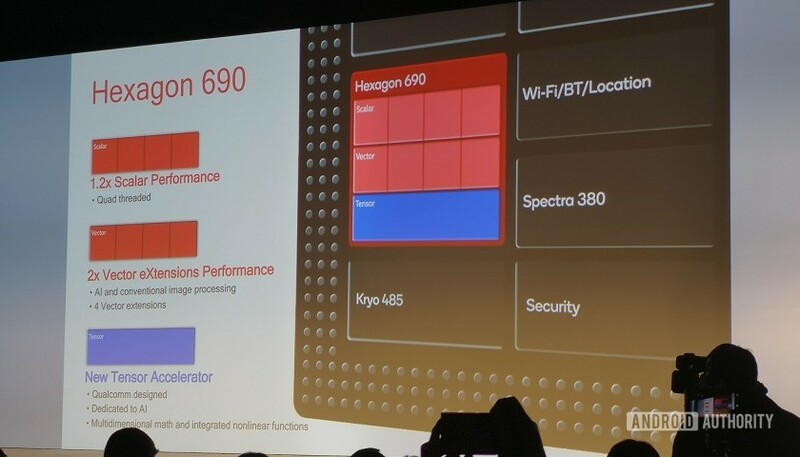 Compared to last generation’s Hexagon 685 , the Snapdragon 855 boasts a new Hexagon 690 unit. Inside you’ll find two additional vector processing units, doubling the component’s general math crunching capabilities. Qualcomm has also introduced a brand new Tensor Xccelerator, offering up more throughput for specific, complex machine learning tasks. Qualcomm states that AI performance is 3x greater than previous generation products and up to 2x versus the Kirin 980. Although this will vary widely depending on the use case. Qualcomm retains a heterogeneous approach to machine learning, utilizing its CPU, GPU, DSP, and new Tensor processor depending on the task at hand. Without dwelling too much on the details, vector mathematics is used a lot in machine learning tasks. These are increasingly optimized for dot product (INT8) form, but Qualcomm’s Tensor processor supports up to 16-bit data. The vector units in the DSP are good for basic machine learning math, such as that which might be used for categorization. Tensors are more complex vector matrix structures or multi-dimensional vector arrays, more commonly used by complex deep learning algorithms, such as real-time convolution for image processing. Tensors are essentially bigger vector matrices encapsulating data that is connected together. This could be color, size, and shape, or feature detection across RGB image color composites. Qualcomm said image processing was one of the key reasons for the inclusion of a Tensor processor. It’s very computationally expensive to perform tensor math, such as mass multiplication, used by many machine learning algorithms. A dedicated Tensor processor improves the Snapdragon 855’s performance and energy efficiency during these tasks. Qualcomm notes that future versions of its Tensor Xccelerator will support even larger order tensors, if the company wants to scale up performance in future models. Overall his has some interesting implications for the 855. We can certainly expect faster, more accurate, and more power efficient machine learning capabilities, such as facial recognition. We could also see some more powerful imaging processing capabilities that could rival what Google offers via its Pixel Visual Core. The revamped CV-ISP frees up cycles inside the Hexagon 690 for even more heterogeneous compute power. Speaking of image processing, the Snapdragon 855 also has a revamped image signal processing unit, now dubbed the CV-ISP or computer vision ISP. The 855 integrates a number of the most common image processing functions into the ISP pipeline itself, freeing up CPU, GPU, and DSP cycles to do other things, and also saving on power consumption by up to 4x. As a result, the Snapdragon 855 can now perform real-time depth sensing at 60fps, enabling the ever-popular bokeh effect in 4K HDR video. The CV-ISP also enables multi-object racking, six degrees of freedom body tracking for VR, and object segmentation. Despite the keenness of the mobile industry, and U.S. carriers in particular, to kickstart 5G networks, there’s a glaring omission from the new Snapdragon 855 — Qualcomm’s 5G X50 modem. Qualcomm isn’t yet at the stage were it has optimized its 5G modem design for use in an integrated SoC. This means no default support for 5G in next year’s high-end smartphones powered by Qualcomm’s new chip. The Snapdragon 855 can still pair up with an external X50 modem and radio antennas to support 5G networks. The Motorola Moto Z3’s 5G Moto Mod has already shown that this can be done with the much older Snapdragon 835. Although the X50 can happily sit on the same PCB as the Snapdragon 855, the modem doesn’t have to come in accessory form. Either way, a lot of 2019 smartphones and networks will still be 4G based. Remember, U.S. carriers are pushing ahead with 5G notably faster than much of the rest of the world. The option to build bot 4G and 5G versions of phones might actually work out well for manufacturers. Instead, the Snapdragon 855 packs in Qualcomm’s X24 LTE modem, the company’s first Category 20 LTE compliant piece of kit. The chip boasts download capabilities up to 2Gbps and upload speeds peaking at 316Mbps. This is achieved through a 4×4 MIMO interface and support for up to 7x 20MHz carrier aggregation in the downlink and 3x 20MHz aggregation in the uplink. Those theoretical speeds sound great, but the real advantages are likely to be found in better connections near the cell edge. The mobile platform also optionally supports IEEE 802.11ax, also known as Wi-Fi 6, for wireless local networks. More devices supporting this standard are expected to appear throughout 2019. 60GHz 802.11ay compliance is also supported as an extra, ready for super fast Wi-Fi transfers above 44Gbps per channel, up to 176Gbps. Most customers are likely pretty happy with the performance of their most recent high-end smartphones, but the Snapdragon 855 makes a compelling case for next-generation products. CPU and machine learning optimizations, a further boost to mobile gaming, and even better multimedia support are all notable and welcome additions to Qualcomm’s premium tier. NEXT: Snapdragon 855 phones — what are your best options? The most important changes with the new Snapdragon 855 are the new CPU design heavily optimized for sustainable peak performance in a mobile form factor, and the huge boost to machine learning processing power. Tweaks to the CV-ISP will also likely present some cool new features to users, and the boost to gaming performance and Snapdragon Elite Gaming features are welcome additions. Finally, the move down to 7nm ties everything together into a package that consumes less power too. We’re certainly looking forward to getting our hands on the first Snapdragon 855-powered smartphones, due out in the first half of 2019. Heads up! Gary talked about this on the podcast too!